Many of New Jersey’s oldest cities still rely on combined sewer systems — systems in which stormwater runoff from city streets feeds into sewer lines and is treated, along with sewage, by treatment plants. Some of these systems are more than 100 years old. During heavy rainfalls the volume of stormwater in the older, combined systems can overwhelm the capacity of the treatment plant. When that happens, combined sewage can overflow into area waterways, or back up into streets, public spaces such as parks, and sometimes even residential basements. This makes the sewage treatment plant operator vulnerable to lawsuits under the federal Clean Water Act. Jersey Water Works’ initial efforts involve working with communities and utilities that have combined sewer systems, to help them identify and implement the appropriate combination of strategies to reduce sewer overflows. The Jersey Water Works Community Engagement Committee has developed graphic images for signage that can be used by combined sewer system cities and towns, organizations, and individuals to educate the general public on combined sewer overflows. These images have been approved by the NJDEP for permit holders to use to help fulfill their NJ CSO permit public participation requirement. A full installation includes three images: a warning, explanation, both full and simplified, and contact information. The images can be used together on one sign or in a variety of combinations. This report highlights how low-income households are affected by the costs of fixing combined sewer overflows. It also recommends strategies to help cities pay for the federally mandated improvements to these systems. This white paper draws upon best practices from across the country to provide New Jersey’s CSO communities with smart solutions that employ innovation, reduce costs, and deliver tangible benefits that build community support. Prepared for New Jersey Future. 2015. This model RFP includes a scope of services and consultant evaluation criteria, and is intended to enable a CSO permittee or regional collaboration of permittees to hire the professionals needed to develop a successful long term control plan — one that meets regulatory requirements in a cost-effective manner while maximizing benefits to the community. Prepared for New Jersey Future. 2015. 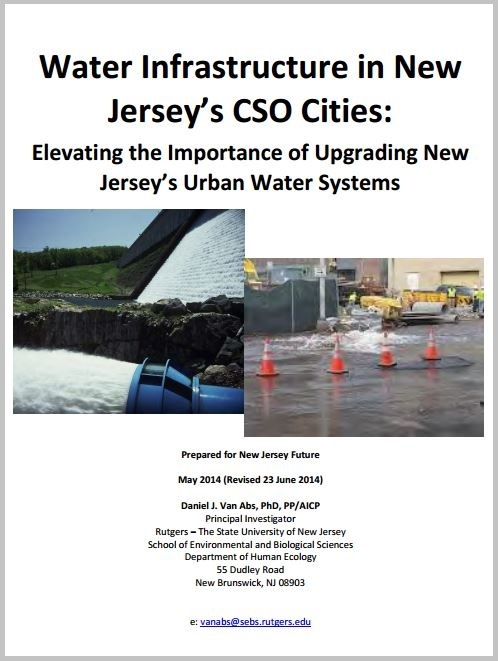 This report describes the new regulatory requirement facing the 21 New Jersey municipalities that have combined sewer systems, the characteristics of those cities and their combined sewer systems in particular, and the challenges they face in upgrading the systems. Prepared by Daniel Van Abs, PhD., for New Jersey Future. 2014.